Slick Hills RV Park is open for business 7 days a week! on a hot summer day? 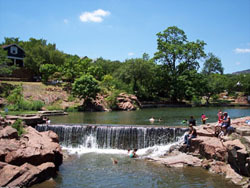 Enjoy a dip in the Medicine Park swimming hole. There are over 10 different lakes and ponds on the refuge that are open for public use and offer opportunities for both boat and bank fishing. Or if you just want to relax and enjoy the beautiful outdoor scenery, Mt. Scott is a great place where you can DRIVE to the top and enjoy the magnificant view.